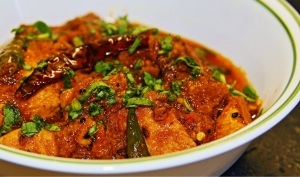 Achari Murgh: Achari murgh has been made in the North India, particularly in places like Rajasthan for a long time. As the weather in the north of India is quite warm, curries such as achari murgh, using pickling spices, enhance the flavour whilst helping to preserve the food for longer. Mustard oil in this dish makes it have a unique flavour. Grind fenugreek seeds, mustard seeds, fennel seeds and onion seeds coarsely. Slit the green chillies, keeping the stems intact. Add the chicken, slit green chillies and coarsely grinded mix and 1 tablespoon salt in a bowl. Add in the yoghurt and turmeric powder. Set the mix aside in a refrigerator to marinate, for 1 hour. Heat the oil in a deep non-stick pan, on medium heat. Add in the chopped onions and dried red chillies. Sauté the mixture till lightly browned. Add in red chilli powder and coriander powder. Add the marinated chicken along with the marinade. When the curry comes to a boil, cover and cook on low heat for 15 minutes or till the chicken is completely done. Season the Achari murgh with salt. Let the achari murgh stand for 10 minutes. Garnish with chopped green coriander leaves and serve hot achari murgh with steamed rice or Indian flat bread. If you have any queries regarding the Achari Murgh recipe, please leave a comment.